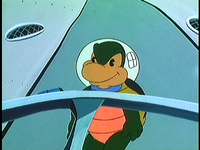 Space Troopas are the soldiers of Moon Man Koopa in The Super Mario Bros. Super Show! episode, "Stars in Their Eyes". They are Koopa Troopas wearing an oxygen helmet. At the start of the episode, Mario, while maneuvering his spaceship through a swarm of flaming meteors, mentions that he is being chased by King Koopa's Space Troopa minions; Mario evidently escaped these Space Troopas. They later appear as Moon Man Koopa's aides in the Quirk Factory. A similar enemy appears on the Moon in the NES version of Mario's Time Machine, but are normal Koopa Troopas wearing a helmet. When knocked into their shells, the helmet covers the top of the shell instead. This page was last edited on January 29, 2019, at 12:33.